In your dream, no one can hear you scream. What secrets is the boy in the swamps hiding? Stephanie Boulder has returned to the town after fifteen years to take care of her grandmother, who is terminally ill. She writes for the local paper and as soon as she starts digging into the story of Julian Long, she discovers secrets deep within the town’s history. Secrets so cruel, so profoundly buried, uncovering them will put her life in grave danger. What if dreams weren’t just dreams? Would you dare to sleep again? Desperate for answers, Stephanie embarks on a journey that spans beyond her beliefs, heading towards a terrifying nightmare, trying to figure out who the Umbrella Man is. 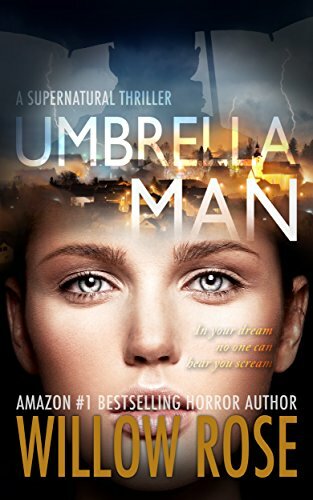 Umbrella Man is a page-turning supernatural thriller from the Queen of Scream, Willow Rose. It is fast paced and packed with suspense. This is one book you don’t want to miss. Fans of Stephen King, Blake Crouch, Paula Hawkins, Kendra Elliot and Robert Dugoni will be gripped by this page-turning supernatural thriller, guaranteed to keep you reading till the next morning. THE QUEEN OF SCREAM EVEN SCARES YOU IN YOUR DREAMS!